Just wrapped up another Astro City script—and just signed contracts for what used to be called American Gothic, but now has a new title, which I’m sure we’ll be telling you about in time. But for now, let’s see what’s come in via e-mail. Don’t have a lot in common with you, except for one thing—Sept. 16, 1960. ‘Twas a fine day, that day. Well, I liked it! And it gave us Mike Mignola, as well. And, if I recall correctly, inker Keith Williams and Legion fan and onetime Marvel typesetter Brenda Mings. A pretty productive day, September 16, 1960. I just saw my letter in the Astro City lettercol! That was awesome! What a beautiful cover on that issue. Give my props to Alex. And I loved that ending. Dark Age was a decent story, not my favorite, but that ending covering Samaritan made it worth while. I’m a big Samaritan fan. Anyway, I just wanted to say thanks for putting my letter in the lettercol and, also, I wanted to make a prediction. I think Old Soldier is the Silver Agent after years/decades/(centuries?) of time travel. I’m eagerly awaiting the Silver Agent specials (there are two, right?). Keep up the great work! Thanks. The Old Soldier and the Silver Agent, hmm? It’s an interesting idea, at least. And I guess you’ll find out if you were right or not pretty soon. I do not speak your language, then translate the Portuguese to their language by Google. Forgive me. I’m 29 and I became a fan (of carterinha, as they say here in Brazil) when I read Superman: Secret Identity. For me the best Superman story ever written. I say this because I was tired of the sameness of the comics. Nobody grows old, no one dies (and remains so), nobody does child, very annoying. Unlike the manga, where the stories have a beginning, middle and end. No wear of the hero. Then comes before me this story his own, I wanted to film that turned the world to see his genius, proving that the character may be subject to major routes. Well after this statement, I humbly ask if you want to do a similar project with other iconic characters from DC or another editor and if you use twitter, so you can follow more readily their future work. I am indeed on Twitter, Xiko, and you can find me here. As for doing another project like Superman: Secret Identity with a different iconic character, all I can tell you is to get ready for Batman: Creature of the Night, by me and John Paul Leon—along with letterer Todd Klein and editor Joey Cavalieri, who also worked on S:SI. It’s not the same as S:SI, since Batman’s a different character and deserves a different kind of story, but it’s definitely in the same territory—and John Paul is doing absolutely gorgeous work. It won’t be scheduled until a lot more of it is done, but it’s in the works, at least. I’m writing a paper on comics and politics and wanted to ask you a few questions. Is it common for writers to inject their own political views in the content they are writing? Is it fair to say that most writers tend to be liberal in views? Also, I just now had a chance to read the Jefferson related post on your blog and I can’t believe that someone would drop your books just because you made a comment relating to the tea party. Right now, my home state of Kentucky is in the national spotlight because of Rand Paul of the tea party—he doesn’t represent Kentucky values—that much I know. 1. I think it’s almost impossible for a writer to not put some sort of viewpoint—social, philosophical, political and more—into their work. It’s their work, after all. It comes from them, and reflects who they are. But I suspect that’s not what you mean—you’re probably thinking about writers having characters serve as a mouthpiece for political speech. And there’s been plenty of that in comics over the years, whether it’s Cap socking Hitler, Bucky urging readers to buy war bonds, Stan Lee’s anti-Communist stuff of the early Sixties, his anti-racism stuff on the later Sixties (and Bob Kanigher’s, and Denny O’Neil’s, and Roy Thomas’s and more), Steve Englehart’s politically-disillusioned Cap or feminist Wonder Woman, and on and on. Comics are fiction and fiction says things; it’s unreasonable to expect them to be viewpoint-free. That said, I think good writers will write stories informed by their own sensibilities, while still respecting the characters’ established personality. A conservative writer may think liberals are a bunch of nutcases, but he shouldn’t write Green Arrow as a John Bircher, because that would be inappropriate to the character, just as it would be for a liberal writer to make USAgent into a knee-jerk lefty. 2. I don’t get into that many political discussions with my fellow writers. I know more liberals than conservatives, and if I had to guess I’d guess that comics writers skew liberal, but I know folks on both the left and the right (and a batch of libertarians, too). And hey, Rand Paul’s going to be interesting to watch, at least. My son and I have been collecting comics ever since Arrowsmith came out…I was trying to get him to read more, which he struggled at, when he saw ‘our’ name in Atomic Comics window on an Arrowsmith poster. He started reading and never stopped. I am now in my mid 40’s and he is 21 and we still enjoy comics…Astro City…Walking Dead are our favorites. Although we don’t see each often…when we do…we always spend some of that time commenting on the latest editions. There will indeed be a follow-up to Arrowsmith, though it’ll take a while. We’re doing it as a heavily-illustrated prose novel, sort of like Neil Gaiman and Charles Vess’s Stardust (but instead of Neil and Charlie it’ll be me and Carlos, and instead of Stardust it’ll, uh, be Arrowsmith). But between my writing schedule and Carlos’s deadlines as an exclusive artist for Marvel, it’ll take a while. But we’ll make it as good as we can manage, and I hope you’ll think it’s worth the wait. And so goes the mail. More in a while, I’d assume! There’s been a lot of references to Thomas Jefferson used as support for “rebellion” of late—”rebellion” in quotes because people like Newt Gingrich seem to want to use it as red meat and then immediately walk it back, saying they meant only “political rebellion,” like Jefferson meant, not any of that nasty shooting and killing that someone might do but Newt wouldn’t want to be accused of fomenting. The people cannot be all, and always, well informed. The part which is wrong will be discontented, in proportion to the importance of the facts they misconceive. If they remain quiet under such misconceptions, it is lethargy, the forerunner of death to the public liberty. …And what country can preserve its liberties, if it’s rulers are not warned from time to time, that this people preserve the spirit of resistance? Let them take arms. The remedy is to set them right as to the facts, pardon and pacify them. What signify a few lives lost in a century or two? I just wanted to say that you’re one of my favorite comic book writers and that I love Astro City. I’ve turned several of my friends onto the comics and consider the Confessor story-arc to be one of the best ever. So it saddens me to have made the decision to not buy any more of your comics. I don’t appreciate your comments on facebook about the “uninformed morons” that are “rebelling” against the government. But whatever. You won’t care about losing one fan. 1. Matt, the reader, sent it here rather than, say, responding on Facebook. Matt, thanks very much for the kind words about Astro City. I’m glad you liked it, glad you shared it with others, and I appreciate your letting me know. But as noted, I’m not wild about the message you’re trying to send, or at least that I think you’re trying to send. I believe the proper response to speech you don’t like is more speech, to vigorously debate ideas in the public square, as it were, rather than to try to silence people you disagree with by punishing them for that disagreement. That said, you’re absolutely entitled to stop buying my books, for any reason you choose to. You don’t need to justify it at all; it’s entirely your choice. Me, if I felt constrained to stop buying books by people who disagreed with me politically, I’d start off by losing one of my favorites, Bill Willingham’s Fables, and I’d cost myself the work of Chuck Dixon, too, which I think would be a real loss. Bill rarely says stuff online that offends me, but Chuck does, Ethan van Sciver does…but I figure that’s their right, and I’d rather read their work than try to curtail their speech. I’m not buying what they say online. I buy what they write and draw. If I didn’t like what they write and draw, I wouldn’t buy it, but I’ll make my choice based on the material, not political opinions expressed outside the material. And if I felt moved to argue with them, I’d argue, pitting speech against speech. But that’s my choice, not yours. I do find it a little sadly ironic that in objecting to me calling people—I assume you’re referencing Tea Party people—”uninformed morons” who are “rebelling” against the government, you missed that I was summarizing Jefferson’s position, not actually agreeing with it. He felt that there would be people who would not be “well informed,” and that they would be “discontented,” all the more discontented based on how important the stuff was they were wrong about. And he felt that the proper response was to “set them right” and “pacify” them, and if people died in the process, he didn’t think that was too great a price to pay. That was Jefferson. And I doubt he was referring to the Tea Party activists, because he’s been dead for a few years. I don’t agree with him that killing rebels is no great price to pay, though. 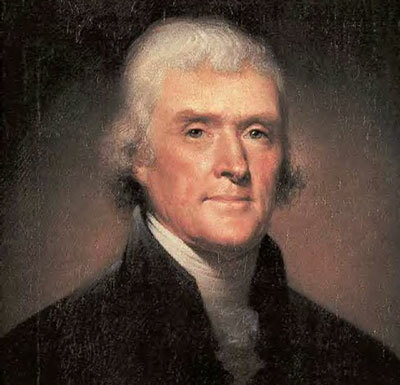 I think anyone dying over this current political flap would be (and has been) a stupid and senseless tragedy, which is why I also see irony in people waving around the words of Thomas Jefferson to support “rebellion,” without understanding that Jefferson thought rebellion and subsequent pacification, with blood spilled, was a pretty good way to shake out the misinformed and educate the populace. As for whether I care about losing one fan—of course I do. I’m glad of every reader I’ve got, I’m sorry at every reader I lose, and I’m pleased at every reader I pick up, which is why I’m glad that you shared Astro City with friends. Where I draw the line, though, is at letting readers dictate to me what I can and can’t say on Facebook, Twitter, this blog or wherever else. If I’m expected to muzzle myself rather than lose readers…well, in that case, yes, I’d rather lose the readers. So thanks very much for your support, it’s greatly appreciated. And sorry to see you go. I hope you’ll reconsider at some point, and if you do, I hope you like whatever you pick up. Well, that’ll do wonders to win over people who think she doesn’t have enough experience.